There could be a hundred other videos trending on the internet right now, but there's only one that I'd happily agree to watch on a loop for the rest of my days. That video is this side-splitting parody of Lady Gaga's "Million Reasons" that actor Elena Skopetos brilliantly turned into a ballad about nothing other than "A Million Raisins." 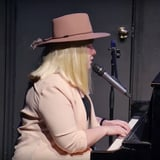 Skopetos is a performer at the Upright Citizens Brigade Theatre in New York City, and in the video, she sits at a piano in a blonde wig and a fedora, soulfully airing out her grievances after an acquaintance gave her the ultimate gift of a million raisins. "You handed me a million raisins / Give me a million raisins / That is just too many raisins / Where'd you get those raisins," she sang throughout the song before two male dancers appeared on stage with a pitcher of raisins that they handed out to the audience . . . and later fed to Skopetos by the handful. Watch the hilarious video for yourself above.